Nice shot; looks like one can even see a few stars. HOWEVER, are you sure that those lights are not from Beautiful Downtown Patterson (or even Alice Springs)? Just read eeek's post about the cables not being up yet..."As a result, the Half Dome cable route and subdome are covered in deep snow"
Edited 1 time(s). Last edit at 05/10/2010 06:03PM by The Other Tom. Perhaps details that cannot be publicly disclosed. I'd have to say its definitely a fake. But not near as bad as the Half Dome video from Turlock video. Give the fake video some respect. Do you know how long it took to fake about 1700 frames of video? I don't understand why everyone is so hard on this idea..I have seen a lot of research (on the internet mind you) from individuals who have went to both sites, photos, and videos etc and I just don't see how a conspiracy to fake this type of thing could stand this long...BUT...I guess I don't believe in it with 100% of my being either....As a lonely boy from Indiana who longs for the Sierra I am really interested in this topic nonetheless! Seriously, you can see El Cap, Half Dome, and many other higher peaks and ridges from the San Joaquin Valley and conversely you can see lots of the valley from these high places in the park. We are having fun with this because of all the fuss over the picture posted a year or so ago taken from Turlock. It has a silo in the foreground. I have posted a short video clip from the Turlock location showing El Cap and Half Dome. http://www.youtube.com/watch?v=AFX4LR7-u6Y There are still some skeptics out there though. Edited 1 time(s). Last edit at 05/26/2010 03:06AM by mrcondron. As you're driving out 120 just past Crane Flat you pass a road on the right that goes up to the Fire Lookout / Helopad, just pass this you get to a high point in the road and start downhill. There's a few places on this downgrade where you can look to the left and at night see the lights of the Central Valley at night. I imagine the Fire Lookup has an even better view. If you're ever driving by, and the gate on the road to the Lookout is open, and you've got some time, it might be worth your time to drive up and take a look. Geez. You guys are something. It's taken from the Diving Board. It's not fake. Looking the other way from same spot. at the 80% Dome turnout for a bit. Some folks believe we faked going to the Moon nine times. If it goes as planned I'll get a shot of Turlock from Sentinel Dome on the 22nd. cannot make any distinction between Turlock and Patterson to the west). Fake??? After all this time (and evidence)....sigh....see what I miss when I get sick!! I have seen other pix of the valley from Cloud's Rest -- I will ask one of the other guys if I can post it. Edited 1 time(s). Last edit at 05/24/2010 05:22PM by Bee. I tried taking one last year atop there but it was a full moon. Plus I didn't realize that my camera had 60 second exposure at the time. Bee my pix was taken from The Diving Board. Actually it looks like he took it during full moon. how? I will ask him to come to our forum for a visit and talk about the pic -- he is an avid avid photog. As I recall it was a full moon or close to it but that is ok for such a short exposure, I had planned to do some star trail photos that night but the moon stopped me. I have several exposures of this image of different lengths of time but I liked this one the best. I'll have to try some next full moon. I finally got a camera that has Shutt/App priority. The ones above were 60 second exposures on "Starry Sky" scene. Yeah... amateur ... that's ok. Here's the shot I took from the Board zoomed in. Mizzzzz Beeee... we gotta get atop El Cap and get peekture there. I think I can see a silo. That's not Turlock - it's Woomera... and that's not a silo. Well anyway a large shafty thing sticking up from the ground. 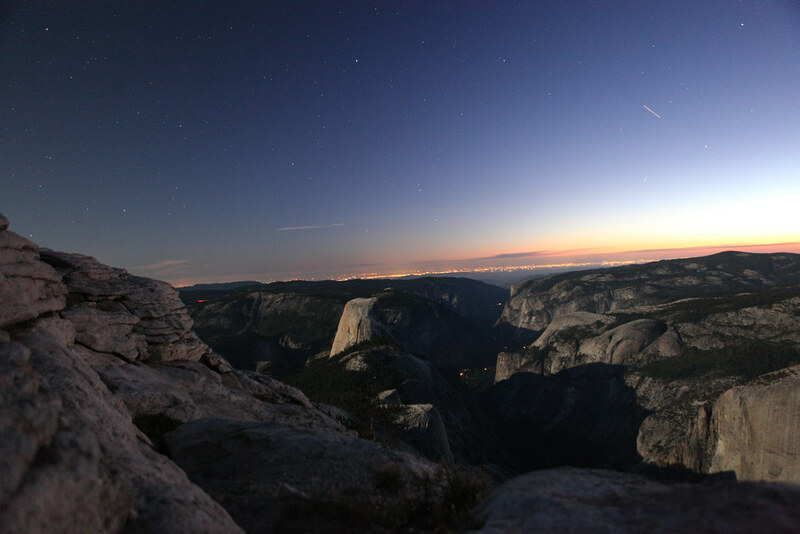 By end of this year we'll get shots from Sentinel Dome, El Cap, and maybe near top of Mt. Clark. In all honesty I wish you couldn't see the Central Valley. It takes away from the wilderness feeling. down into Kibbie Lake. (on the trail that runs from Lake Eleanor to Kibbie). Dat UFO ting moofed agin! Goatie, is this the ridge that you and GW (goat whisperer) bushwacked down to Kibbie? Makes wilderness not feel like it. Turlock is also visible from Turtleback Dome!!! On a clear day you can see Half Dome, El Capitan, Clouds Rest, Vogelsang Peak, and many other Yosemite landmarks from the Turlock area. The reverse is also true. I've seen it both ways many times in the 40+ years I've worked in Yosemite. 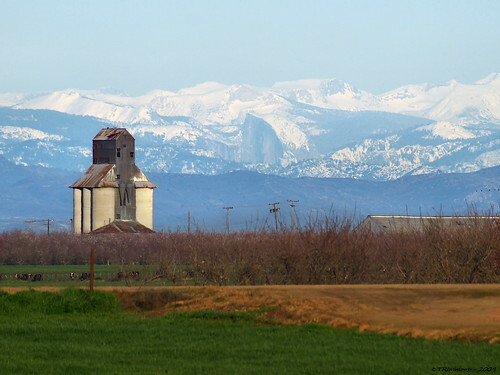 The big stink about the possibility of seeing Half Dome from Turlock has been fun. I don't know if you followed it over the last couple of years but the controversy roared on a couple of the photography forums last year. Fake/Not fake/Fake/Not fake. I've taken video from the "Famous Picture" site with a zoom in and out. Nice video. Are you also the author of the really clear still from the same location? I wanted to use that image on an educational sign about Yosemite snowpack and a couple of people up here said it was fake and we shouldn't use it. I suppose it's better to be skeptical than totally gullible. I think he is a pro or at least a semipro. A very nice guy. Last year I posted that I was going to Hall Road in Turlock to shoot some video of Half Dome and he was there waiting for me. We hung around for a couple of hours but clouds had closed in on Half Dome so we didn't get any decent pictures. I went back the next day and got some video and a few stills but the air was pretty hazy. In March of 2010 the air was a bit cleared thus the video you saw. I'm still waiting for the day when there is snow on Half Dome, the air is crystal clear, I'm available, and I have the inclination. A tough combo! I wouldn't be at all surprised to find that Tony would be thrilled to have that picture used that way along with stated assurances that it authentic. He would probably want it credited also. I don't know his email address. Thanx for the post Bee and Mike. As I read through all these threads that the link leads you to, I could not help but chuckle at the sarcastic post of the guy who says he can see Russia from his house! Edited 1 time(s). Last edit at 05/31/2010 06:38PM by Catalonian Burro. Thanks for the link! I hadn't seen the panorama before. It's nice to see Mount Clark (one of the most easily identified peaks in the area) in the shot. I have several pictures from the Turlock area myself, but they are pretty fuzzy. I've been trying for years to be there at the right time. The problem is that nice clear days after winter storms are usually declared burn days and visibility decreases rapidly. It has become a running joke amongst us (lower) valley dwellers that we make declarations that we think that it might be "Half Dome Weather". They day that Mike took the video, I was out and about and I realized that I could see snow on both the coastal range ahead of me, and the mountains through my rearview mirror. I made the call instantly, and dispatched Mike the the inconic grain silo.....and the YouTube video was the result! Gorgeous! I even enjoyed reading through the old thread again, thanks for the update.